Once Lightroom 4 directions were completed, next on the list was a matching list of directions for using with Photoshop CS6 and its mate, Adobe Camera Raw 7.1. I’ll post those directions here, so that anyone using the SpyderCube who has upgraded to CS6 can give this a try, and can send me comments if desired. I will include the annotated illustration for Photoshop CS6; I created a similar illustration for Lightroom, but did not include it with the previous post, since it was focussed on sample before and after images. Adobe Photoshop CS6/ACR 7.1 introduces improved adjustment controls, and requires a new method of adjusting images using the SpyderCube. 1. 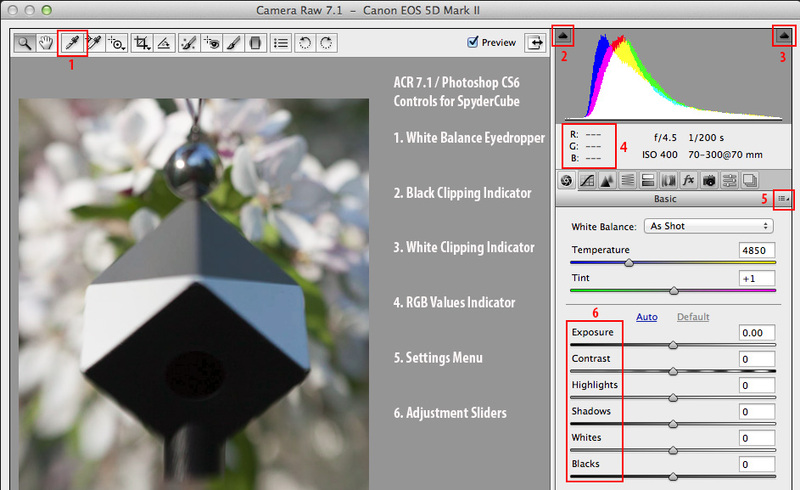 Trigger ACR 7.1, by opening a RAW file that includes the SpyderCube, in Photoshop CS6. Set the White Balance by using the eyedropper to sample from the center of the lighter of the two gray faces, which represents the primary light source’s color temperature and tint. 2. View RGB values in the Histogram Section. Set the Exposure control so that the lighter gray face has RGB values of 128, or your preferred card gray value. 3. Set the Whites control so that the lighter white face has RGB values of 230, or your preferred card white value. 4. Turn on White Clipping Indicator. Check that Specular Highlights in Chrome Ball reach 255 and trigger White Clipping Indicator. If not, increase Whites level to achieve Specular Highlights, and adjust white face back to 230 using Highlights control. Optimize relation between Specular Highlights and Card Whites with Whites and Highlights controls. 5. Turn on the Black Clipping Warning. Adjust the Blacks control until the SpyderCube’s black trap is mostly or entirely to the Black Warning color; RGB values of 3 or less. 6. Adjust the Shadows control until the black face shows RGB values of 13 to 26, depending on the amount of “bounce light” illuminating the black face. Turn Black Clipping off for visual check that black trap can be easily distinguished from black face. 7. Recheck the card white and card gray RGB values again, as each adjustment can effect the adjustments made before it. Retune until optimal. 8. Apply this set of adjustments to all other images shot under these lighting conditions by saving a Preset from the Settings Menu, and applying to each image, or apply to an entire group of images using Adobe Bridge. This method now has five controls, instead of the three used in earlier Processes, offering finer control of shadow-to-black ratios and black clipping, and highlight-to-whites ratios and white clipping. Adobe CameraRaw 7.1 interface, with the key elements noted. I’ve been working on the necessary directions for using the Datacolor SpyderCube with the new controls in Lightroom 4’s Process 2012. I’d appreciate any feedback from photographers who try this out. You don’t need to take a new shot of the Cube to test this, you can take a previous image with the Cube in it, reset it in Develop (which will automatically update it to Process 2012), then use these directions for making your adjustments with the new controls. 1. Go to the Lightroom Develop Mode. Set the White Balance by using the eyedropper to sample from the center of the lighter of the two gray faces, which represents the primary light source’s color temperature and tint. 2. View RGB values in the Histogram Section. Set the Exposure control so that the lighter gray face has RGB values of 50%, or your preferred card gray value. 3. Set the Whites control so that the lighter white face has RGB values of 90%, or your preferred card white value. 4. Turn on White Clipping Indicator. Check that Specular Highlights in Chrome Ball reach 100% and trigger White Clipping Indicator. If not, increase Whites level to achieve Specular Highlights, and adjust white face back to 90% using Highlights control. Optimize relation between Specular Highlights and Card Whites with Whites and Highlights controls. 5. Turn on the Black Clipping Warning. Adjust the Blacks control until the SpyderCube’s black trap is mostly or entirely to the Black Warning color; RGB values of 1% or less. 6. Adjust the Shadows control until the black face shows RGB values of 5% to 10%, depending on the amount of “bounce light” illuminating the black face. Turn Black Clipping off for visual check that black trap can be easily distinguished from black face. 8. Apply this set of adjustments to all other images shot under these lighting conditions by using Previous button, or by saving as a Preset. I tested this process on a number of my own files, and this example was a compelling argument for using the Cube. We often think such assistance isn’t needed outdoors under good sunlight, and even less important with a lens such as a Lensbaby. But the shots below show the SpyderCube used under just such conditions, and a related image before and after applying the resulting SpyderCube corrections. It produces a noticeable improvement in white balance, turning the sky a more appropriate sky blue, the shingles a more accurate shade, shows more saturation in the flowers, opens the shadows on the porch, increasing shingle detail under the porch roof, while improving the punch of the dark windows. Could I have made similar adjustments without the Cube? Perhaps, but how does one know just what corrections to make, without a reference? The Cube manages to pack several references into one device, and captures side lighting of the type in this photo in a way that a flat target does not; a flat target would captured much less sun, and much more blue sky bounce, and given a significantly cooler white balance. This is the shot with the SpyderCube in it, after adjustments. Here’s what the next frame looked like, at default settings in Lightroom. Here are the subtle, but excellent, adjustments the Cube settings provide. 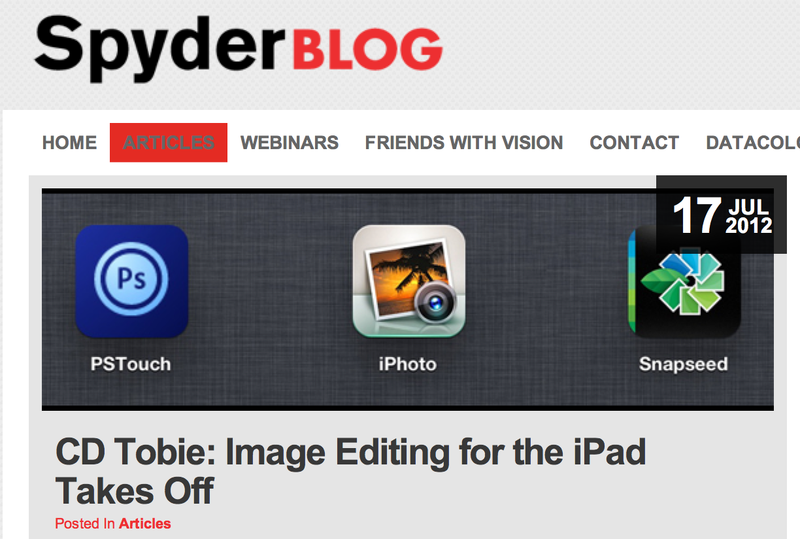 I had a request to write an article about iPhoto for iOS for the Datacolor SpyderBlog. But the appropriate context for that was to compare it to Adobe’s new iOS image editing app, and the app from NIK that was the leader before the big guns moved in. Here is a link to the article detailing the pros and cons of all three apps. 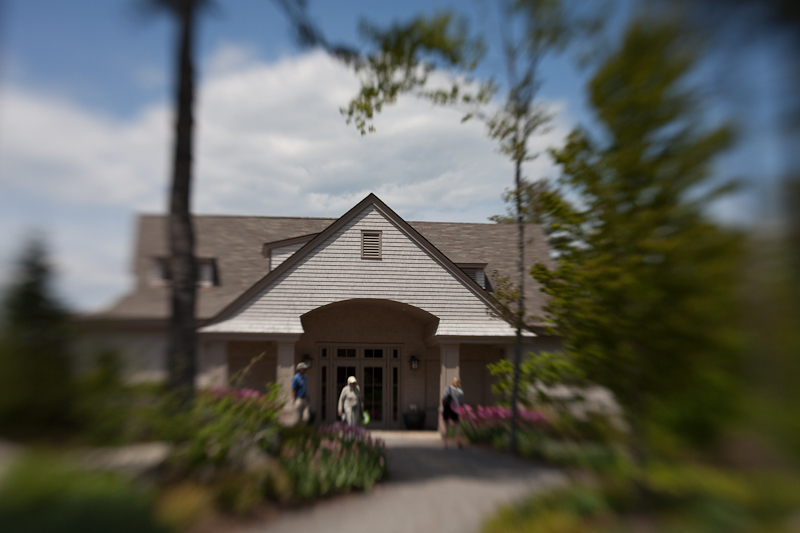 People talk about the “depth of field” with a lens at a given setting. 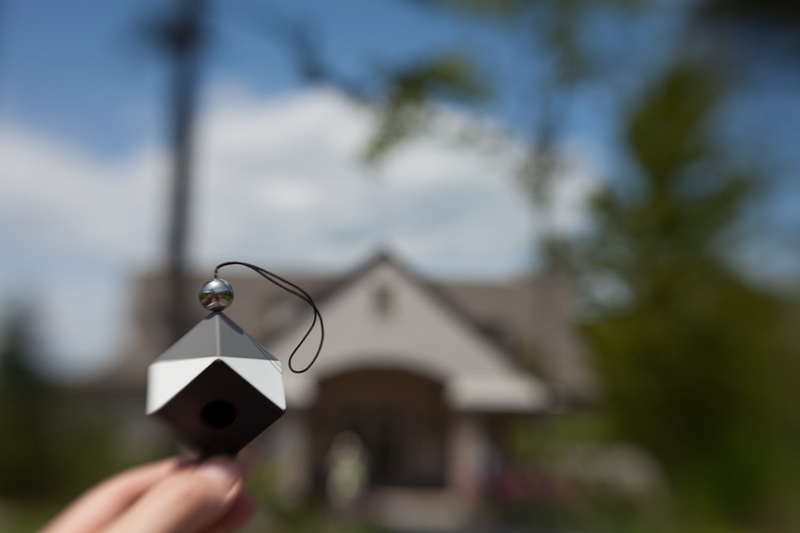 I believe that depth of field is something of a myth. 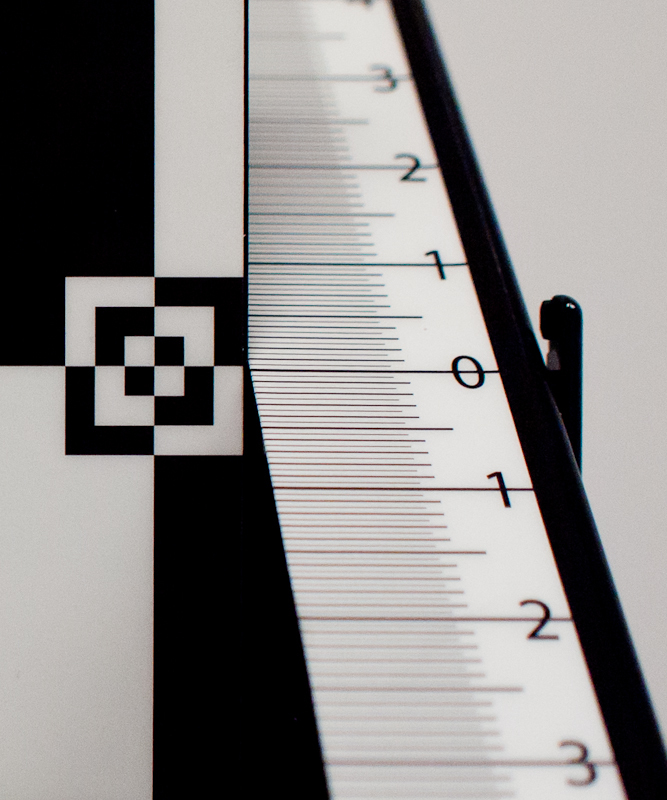 The actual depth of truely sharp field is, effectively, zero, so it really boils down to “point of focus”. With paper prints made from film, there was a fixed resolution to the film, and a fixed, lower, resolution to the paper. So there was a zone in a print which all had the same apparent sharpness, and then a drop off in front, and behind, that zone. Thus the “depth of field” myth was born. When digital began to mature, some long-time photographers observed that, while the maximum sharpness in digital was now sharper than with film, there was less “depth of field” in digital prints. Lets consider the focal sharpness to be a cartoon mountain, a triangle, up on one side, from the foreground, to the point of focus at the top, and down on the other side beyond the point of focus. Changing your aperture makes the sides of the mountain steeper or shallower, but it doesn’t actually change its shape. The mountain always came to a perfect peak at the top, but there is this cloud obscuring the top; a small cloud, high up, in the case of a chrome, but a bigger one, further down, in the case of a paper print. From our point of view, that made Mount Depth of Field look like it had a flat top on it; as there was a zone of even sharpness; caused by the film and paper resolution, not the lens. Now we move on to digital: the best of the sensors, the best of the lenses, the best of the printing systems, provide a significantly sharper set of capabilities. So the cloud gets smaller, and higher, and the mountain starts to look pointed on top. And people complain there is less depth of field in digital. No problem; run a gaussian blur cloud over your image, and the depth of field will magically return, along with the lack of sharpness that caused it in the first place. I owe credit for much of this piece to a discussion with Vincent Versace. Only the mountain is totally my own. I suspect one of these days I’ll catch up with my reading, and find this already covered in a book; probably somewhere between Oz and Kansas, actually. Two common types of synthetic images created in Photoshop are gradients and step wedges. The most common gradient is an even field, from black to white, to test for the smoothness of your display or print. The most common step wedge set is a set of patches from black to white in a specific number of steps, created from the type of gradient described above. Color Management has required building synthetic images of these types in Photoshop since time immemorial. This gives us the long memory to recall the changes that have occurred over time, with updated versions of Photoshop. The first of these changes, which happened along about Photoshop 6 (not CS6) was a change to the algorithm used to define gradients. The Photoshop team felt their linear gradients did not look as smooth as they could, so a S-shaped spline curve was introduced into the process. This did, indeed, improve the visual look of gradients, but it was problematic for technical uses, where a linear gradient was needed. So complaints were lodged, and an update included a checkbox for restoring the earlier, more linear, behavior, where the gradient darkened by the same amount for each unit of distance, rather than feathering at the ends. More recent versions of Photoshop have added a slider control for adjusting this function. It can be found in the Gradient Editor (which appears when you choose the Gradient tool, then click on the gradient itself in the bar at the top). This slider is named “Smoothness”, and its default setting is 100%. This means “100% smoothed” and is the inverse of “100% linear”; so the Smoothness slider is set to zero to get a linear gradient. A visual comparison of a smoothed gradient, and a linear gradient, is the best way to understand the difference between the two. This may be of value to those wanting to create test images, and know that one inch across is half as much change as two inches across, but there is another, more practical reason that knowing how to create a linear gradient: such gradients are the basis for creating step wedges as well. A step wedge is a set of patches, typically squares, with known values, typically running from white to black in 10, or 20, or sometimes 256 steps. Such patches can be measured on screen with a screen colorimeter such as a Spyder, or in print with a patch reader such as SpyderPrint. 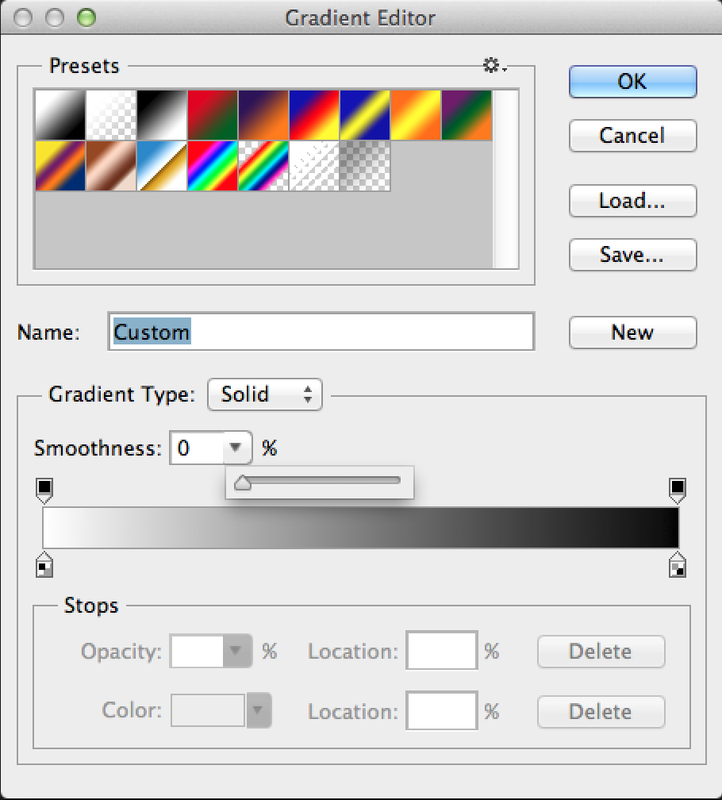 Gradients are turned into step wedges by using Photoshop’s Posterize function (Image > Adjustments > Posterize), with the appropriate number of levels selected. If a gradient is created at Photoshop’s default smoothness setting, the result will be a set of steps which have longer patches at the ends, and shorter patches near the center, due to the smoothing curve. This can cause a great deal of frustration to someone attempting to build a strip or table of patches with both even sizes, and known values. So the magic control for creating evenly spaced step wedges or target patches is the Smoothness control, hiding in the Gradient Editor. Another key to a good set of step wedges is turning off the Dither option in the Gradient bar, to avoid step wedges with grainy edges, from the dithering applied to the gradient when it was created. To assure gradient edges are vertical, and not stepped a pixel here or there, hold down the shift key while dragging to draw the gradient, to be sure it is exactly straight. And a final tip (thanks to Ernst Dinkla for mentioning this one) has to do with mathematical precision in your patches: choose 16 bit mode, and 16 bit units, if your number of patches does not divide evenly into your scale of 100 or 255. Keep these tricks in mind, next time you would like an even set of patches; for technical, or just for graphic design, purposes. Its been a bit over four months since I started this blog, and I felt I should do a short review, before disappearing to Italy for a couple of weeks of photography, and the occasional workshop. Readership has been increasing; in that wobbly way that web stats move. And I keep hitting a new “most views” day every so often, typically in response to a key article on a new device and its color capabilities. First my analysis of the New iPad, then of the Canon 5D Mark lll, and most recently the Retina MacBook Pro. Breadth of readership has been increasing as well. Whether that is because more people around the globe have had a chance to become familiar with my work, or because there is something innately more international about the Retina MBP is yet to be seen. But the recent day when a new record of over 4300 page views was reached was the beginning of a new era, where the US is not always my top readership country (at least not early in the day, when the Eastern Hemisphere has had a lot longer to be up and reading…). 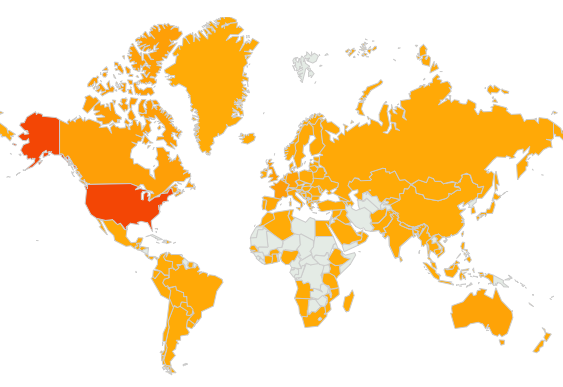 The map of countries from which my blog has been accessed was long ago flushed out; at this point all that remains is for one or another of the remaining countries in Latin America, Africa, or the depths of Asia to finally score a hit. Perhaps summer travel will fill in one or two more of these. I’ll include a copy of the readership map below, though it doesn’t show much that the sentence above doesn’t cover, except for the visual aspect. Its very gratifying to see the blog extend its reach and readership, and to watch the total page views roll past 60,000, and now 65,000. It will be interesting to see if the trend continues over the remainder of the first year, as WordPress assures me it will do. And it is interesting to see more and more sites in other languages linking to my English-only blog, and viewers coming to visit from them, even when they need to translate the page. Thanks to all of you who have read my writings (and occasional ramblings), and especially to those who have subscribed through WordPress, through e-mail, and through Twitter, to receive announcements of each new blog post. And thanks to those who have commented, even those whose comments, on reflection, I have chosen not to publish. All input is information, even when the final decision is that its not sufficiently pertinent to append to the post. And thanks to all my associates in the industry who have commented, mostly privately, about the blog and web authoring in general. Its taking time, but an increasing number of cameras are now offering the capability of adjusting auto-focus in the camera’s menu. This is very useful to users who depend on auto-focus. And a number of these cameras allow you to set corrections on a per-lens basis, so that each lens is individually adjusted. I now shoot with the Canon 5D Mark lll, which is the first camera I’ve used which provides auto-focus so good that I actually use it for the majority of my shooting. The Mark lll offers another first: it allows the user to set different auto-focus adjustments at each end of the zoom range of zoom lenses. Given that one adjustment might not be right for all focal lengths, this is a welcome addition. I could even envision, in the future, offering adjustment setting for both end of the f:stop range as well. But just how do you make all these auto-focus micro adjustments? There are a number of methods, and a couple of tools on the market specifically to assist with this process. But by far the simplest, and the easiest to read, is Datacolor’s SpyderLensCal. I won’t go into detail here about using LensCal, but once you get the general idea of the process (get the sweet-spot at zero, set-up further away for longer lenses, etc) its fairly straightforward. My research today into the camera models now supporting auto-focus micro adjustment resulted in the list of 34 models shown below. Keep in mind that a tool like LensCal can check the focus on most any camera, but it can only be adjusted by the user if its listed below. Other camera/lens combinations that are clearly out of auto-focus would need to be sent in for adjustment.